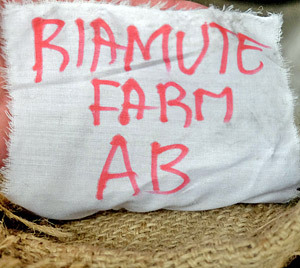 Sorry, we are currently sold out of 'Kenya AB Riamute-Kiambu microlot'. Please check back later. 2016 crop arrived June in grainpro. The Riamute-Kiambu Farm is located about 50 miles from Nairobi in Kiambu County situated in Kenya's Central highlands part of the former Central Province. Nairobi, Kenya's capital, is not far away. The farm is owned by the Faisal family and much of the farm's labors are overseen by Mathew Mugo. The area is used to experiencing constant showers hence the kikuyu phrase 'kia mbuu' meaning the "place of drizzles." This farm is also known as Mama which in Swahili means mother much as it does here. The Mama reference relates to the fertility of the soil, which is a deep red clay. The farm sits at a high 1850 meter altitude (6070 feet) and is almost directly on the equator, located at 1 degree south latitude. On the farm coffee trees are intercropped with bananas for shade. Coffee was planted in the early 1960s mainly with SL34 varietal (96%) and the balance SL28. These are the two most treasured varieties of Kenya, offering a range of juicy flavor and dry finish. The farm comprises only 12 acres and total production of AB was a mere 17 bags. The majority of top Kenya coffee is sourced from cooperatives, or, factories in the local parlance; in these cases locally grown coffee is taken to the wetmill to be processed and marketed. We make a significant effort to directly source top individual lots that are separated for auction and every once and a while we find a single farm's output. It is very unusual to find a single farm that not only grows the coffee but processes it too. Such is the case with this Riamute-Kiambu 'Mama' Farm. Cup Characteristics: Notably juicy and layered with tamarind, blackberry and blackcurrant flavors. Cassis is present and the mouthfeel is pleasantly tart and chocolatey. Long finish. Very classy cup showing the grower's skill at each level of production.